President Obama arrives to Australia to kindle their ‘special relationship’ making plenty of reference to their importance in America’s return to economic stability. 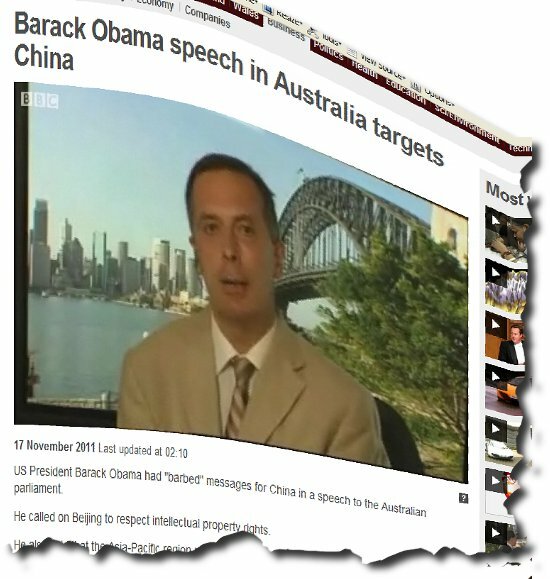 But as our BBC correspondent points out the whole speech was a barbed commentary to China. As America plans to remove troops from Afghanistan and Iraq, almost at the point where you could have sighed with relief that the conflict is beginning its final chapter, and even that the over budget Congress could now start to reign in spending on the military machine, Obama is now set to deploy more troops into Australia and the Okinowa bases just out of reach of Chinese missiles but still close enough to that old hotspot the South China Sea. The South China Sea is a shipping route of major importance as well as having other oil and mineral interests. There was a exchange of live fire between two parties there around six or nine months ago where a couple of civilians on the islands we killed in the cross fire. Obama is reminding every one to play fair by intellectual property, ie, not go stealing American patents and copying stuff without pay due royalties etc and don’t play unfair with your currencies either. Meanwhile Australia is now caught in the middle as by as much favouritisim as she may muster to America, a good deal of her natural resources are owned by China. Piggy in the middle. As long as everyone plays fair says Obama, everyone is a winner. But I suspect some people in the game will want to be ‘fairer’ than others. Someone else has a gun under the table.